When a young woman unexpectedly arrives at her much-older former lover's workplace, looking for answers, the secrets of their dark past threaten to unravel his new life. What follows is an emotional and unflinching excavation of inappropriate love, with shattering consequences. Una: I don't know anything about you except you abused me. Fifteen years after the crime and Ray still pulls at the heartstrings of Una. It is the shadow of love, a brutal charm and broken promise that brings her back to confront him in search of answers. In flashbacks to a Ferris wheel, courtroom and cottage by the seashore, the emotional carnage of two fractured lives is gradually revealed. Una struggles to find meaning in the answers provided by Ray as well as those from inside her heart. 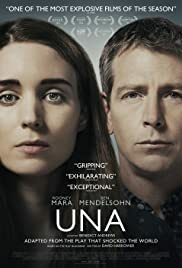 This character driven psychological thriller stars Rooney Mara and Ben Mendelsohn. Each actor specializes and excels in such roles about damaged psyches, and they continue to shine here. Wonderful cinematography, direction and music contribute to heighten the emotional impact of the story. The film is based on the play Blackbird by David Harrower. Just released to Netflix snail mail catalog.